With warm weather on the way for the northern hemisphere, festival season is on the horizon. Shine bright at concerts this summer and make an ombre floral headband to give you some extra sparkle. Love this project? Pin this image! There’s nothing I love more than sweet summery days and sunshine. Pair that with good music, and you have my ideal warm weather experience. Whether you’re rocking out at Coachella and Glastonbury or heading down to the local live music venue for some chill tunes, this ombre floral headband is a sure thing. Ombre is huge this year, and it’s not hard to see why – it’s very satisfying to look at, and even more fun to craft with. Read on to get started! First, you need to find an ombre palette that you like. 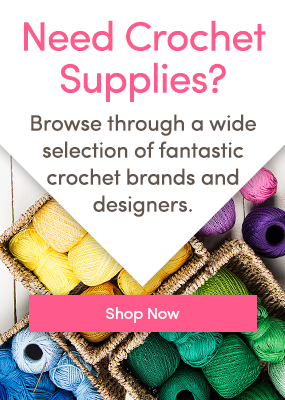 I used King Cole Bamboo Cotton DK – it’s a soft and shiny cotton and bamboo blend, and there’s a lot of fun color palette options to play with. First, make a magic ring to eliminate a hole in the center of the flower. For the first round, make 7 single crochet (UK double crochet) stitches, and join to the first stitch with a slip stitch to form a circle. Round 2: *Chain 5 and slip stitch into the next stitch* Repeat between ** to end of the round to create 7 chain 5 spaces. The petals will naturally overlap, but you can move them around so that all the petals are overlapping in the same direction. Make one flower in each color and get ready to make the headband. For the headband, you’ll be using all of the colors to make a fishtail braid. You will need 2 strands in each color about a yard long. For a more detailed explanation on the fishtail braid, check out our tutorial here. Make enough to wrap around your head with about five extra inches to tie it. Thread the flowers on through the chain 2 spaces at the tip of each petal as pictured here. You’ll be threading through opposite petals, keeping the braided length on the bottom of the flowers. Then all you have to do is tie it on in the fashion you like most. I don’t know about you guys, but I’m ready for summer! Love this ombre floral headband tutorial? Crochet Club: Flower Crown Headband Free Tutorial: Pink Ombré Beach Cover Up! Crochet with Kath – Turban wrap headband Crochet Club: ombré beach bag! Angie A Jack of all crochet, but a master of Netflix and video games. When not crocheting, you might find me on the archery range or in choir practice!